GoAnywhere MFT can connect to a wide variety of database servers including SQL Server, Oracle, MySQL, MariaDB, IBM i, DB2, PostgreSQL, Derby and Informix. Since GoAnywhere MFT connects to database servers over the TCP/IP network using standard drivers, no additional software needs to be loaded onto those database servers. Database server connections can be defined in GoAnywhere MFT as reusable Resources which can then be selected from simple drop-down menus. Any SQL statement supported by the database server can be issued by GoAnywhere MFT including SELECT, UPDATE, INSERT, DELETE, CALL and CREATE statements. Rows (records) can be retrieved from tables (physical files) on the database servers using SQL SELECT statements. 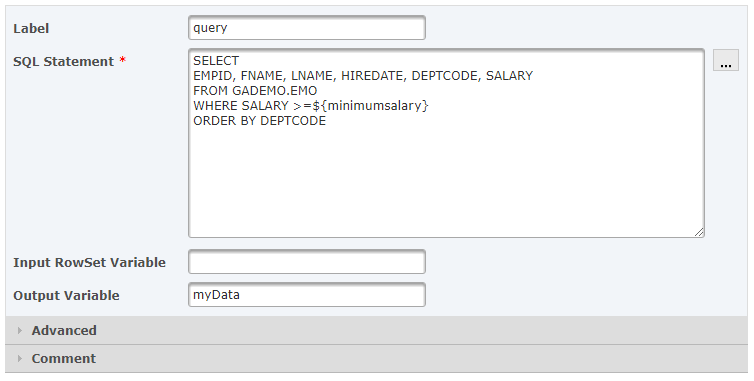 An intuitive SQL Wizard is provided in GoAnywhere MFT for building SELECT statements quickly. With the wizard, the user can choose tables, joining, fields, column headings, "where" criteria and "order by" criteria. The selected records can be converted into Excel documents, delimited text files, fixed-width text files and XML documents. As part of a workflow, the resulting files can then be encrypted and placed on the network or transferred to a remote server. Files can be imported into database tables using GoAnywhere MFT. These files may already exist on the network or may have been retrieved by GoAnywhere MFT from a remote server. GoAnywhere MFT can read data from popular formats including Excel documents, delimited text files, fixed-width and flat file text files and XML documents. The imported data can be appended to the end of existing tables or can replace the contents of the table. Rows (records) can be replicated between database servers using GoAnywhere MFT. For instance, a project could be defined to copy records from a IBM i physical file into a SQL Server table. This project could be scheduled and automated. Records can be appended to the end of a table or can replace the existing records in the table. Request a quote to integrate with databases using GoAnywhere MFT.